COMMENTARY ON "THE DIVINITY OF THE HOLY SPIRIT"
This week’s lesson unintentionally confirms that Adventism has a systemic problem with the Trinity. Even though this entire week’s lesson is devoted to convincing the reader that the Holy Spirit is equal to God, is divine, and even is God, these arguments would not be needed if Adventism actually embraced the classic Christian Trinity. Because Adventism was founded by anti-Trinitarians, because all of their doctrines we established on an anti-Trinitarian foundation, the fabric of Adventist theology depends upon some perversion of the biblical, classical Trinity. If there weren’t strongly non- and anti-Trinitarian understandings implicit in the Adventist doctrines, if these misunderstandings weren’t still be taught, there would be absolutely no need for this lesson. Moreover, this lesson does NOT affirm the biblical nature of the Holy Spirit nor of the the Father, Son, and Spirit. The wording is clear: Adventists understand the Holy Spirit to be a separate “being” from the Father and the Son. He is mysterious, ephemeral, and different, according to Adventism. These statements and questions reveal that Adventists in general have a problematic understanding of the Holy Spirit’s identity and nature. Even though this lesson attempts to lay to rest the historic legacy of anti-trinitarianism, it does not affirm that the Trinity is of one substance. While it does try to help the members see that the Holy Spirit is God and is divine and is equal to the Father and the Son, this entire line of reasoning actually reveals the underlying heresy that has shaped Adventist doctrine. This week’s lesson actually reveals and confirms that Adventists do not see the Holy Spirit as being indivisible from the Father and the Son. They do not see Him as sharing not only the same will and attributes but the same substance. The fact that Adventists need to be taught that the Holy Spirit is God reveals that Adventists think of Him as more of a force, a powerful emanation from the Father and perhaps from the Son. This lesson is seeking to correct a deep, foundational heresy in the formation of Adventist doctrine. Unfortunately, it fails to correct it because even the author understands the “Godhead” to be comprised of three separate divine beings that share authority. James White was a pastor with the Christian Connexion before becoming a follower of William Miller and ultimately helping to found the Seventh-day Adventist Church. His friend and co-founder of Adventism, Joseph Bates, was also from The Christian Connexion. The Christian Connexion was Arian and anti-trinitarian. In other words, they did not believe in the classic Christian Trinity, and they believed that Jesus was not eternal, almighty God. Moreover, most if not all the significant contributors to Adventist doctrine were non-Trinitarians and believed that Jesus was not eternal, almighty God. In fact J. N. Andrews, for whom the flagship Seventh-Day Adventist seminary is named, was Arian. He believed that Jesus was not eternal but had a beginning, that God the Father was the only eternal, true God. It is worth noting that the seat of Adventist scholarship and the headquarters of training for Adventist pastors bears the name of its respected Arian, anti-Trinitarian founder. No true Christian seminary would ever bear the name of an anti-Trinitarian. The lesson makes much of learning to see the Holy Spirit as God in order to learn to depend upon Him to have victory over sin. Nevertheless, this emphasis fails to correct the underlying misunderstanding that the Holy Spirit is somehow separate from the Father and from the Son, that the three are separate from on another. Even though the lesson discusses how the Spirit gives the power to overcome sin, this emphasis reveals the misunderstanding of the nature of man. Adventists do not believe they have “spirits” that are separate from and survive the body at death. 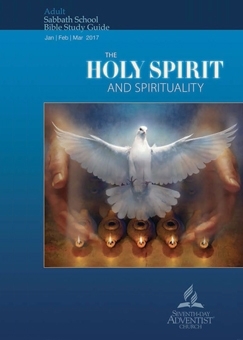 In fact, many Adventists, from the founding of the organization, believed that the Holy Spirit is God’s “breath”, His power and force going out from Himself and strengthening humans. Without an understanding that “spirit” is an immaterial reality and is not merely “breath”, there is no possible way to understand the Holy Spirit as fully God, that the Trinity is one Being expressed in three persons. They have specific roles, but those roles do not exclude the presence of all three Persons. God cannot be divided. He is ONE. The Spirit is not merely God’s power or breath; He is a separate being who is “like” Jesus. He is exactly the same in nature as the Lord Jesus and as the Father. In fact, without an understanding that humans have spirits, there is no understanding that we can be born again, literally made alive after being born dead, literally spiritually dead, in sin. The heresy that man is merely physical, the convoluted arguments used to try to prove that the Holy Spirit is God—these things reveal that Adventism is not Christian. It is not based on biblical truth that sees man as spiritually dead and needing to be made alive. Instead, this lesson attempts to harmonize its disbelief in man as a spirit being with its vague belief that the Holy Spirit is God and that He somehow interacts with physical man. And I will ask the Father, and he will give you another Helper, to be with you forever, even ethe Spirit of truth, whom the world cannot receive, because it neither sees him nor knows him. You know him, for he dwells with you and will be in you. “I will not leave you as orphans; I will come to you. Yet a little while and the world will see me no more, but you will see me. Because I live, you also will live. In that day you will know that I am in my Father, and you in me, and oI in you. Whoever has my commandments and keeps them, he it is who loves me. And he who loves me will be loved by my Father, and I will love him and manifest myself to him.” Judas (not Iscariot) said to him, “Lord, how is it that you will manifest yourself to us, and not to the world?” Jesus answered him, “If anyone loves me, he will keep my word, and my Father will love him, and we will come to him and make our home with him (John 14:19-23). For further reading about the historic Adventist Arianism and anti-trinitarianism, please read “Discovering the Adventist Jesus” on page 10 of this PDF of a past issue of Proclamation!. Copyright 2017 BibleStudiesForAdventists.com. All rights reserved. Revised January 16, 2017. This website is published by Life Assurance Ministries, Camp Verde, Arizona, USA, the publisher of Proclamation! Magazine. Contact email: BibleStudiesForAdventists@gmail.com.